If you're looking for somewhere secure to store your propane gas bottles, the Asgard Asgas 188 is perfect for you. 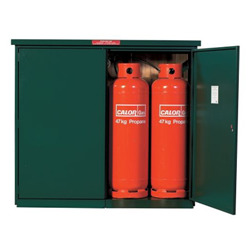 This 6x2 unit has been specially made for storing four 47kg propane bottles and is ideal for use with static caravans, park homes, retreats and lodges, both domestically and industrially. The Asgas 188 is manufactured from galvanised steel.